No special tags had been drawn, so this year was going to start just like any other. 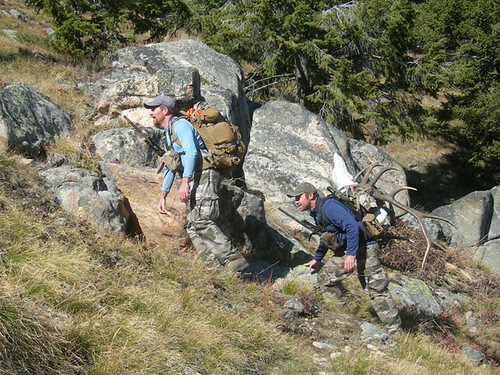 Before the rifle season started I was searching the mountains trying to find a bull. I talked a couple of my friends into helping me glass around their work schedules. One buddy had already killed a bull during archery season and the other had been lucky enough to draw a special tag for another area. Both friends had also committed to going with me on opening day, but only if we had a good bull spotted! If I didn’t have a bull picked out, we’d all being going deer hunting instead! The first night spent scouting ended with me locating a couple bulls, but nothing really got my full attention. The next morning, I got a look at a very nice bull, but only for a few minutes. Later that evening, I saw him for the second time; he was bigger than the others so I focused my energy on staying with him until opening morning. I watched him in the same spot for a few minutes each morning and night leading up to the opener. Everything was falling right into place. 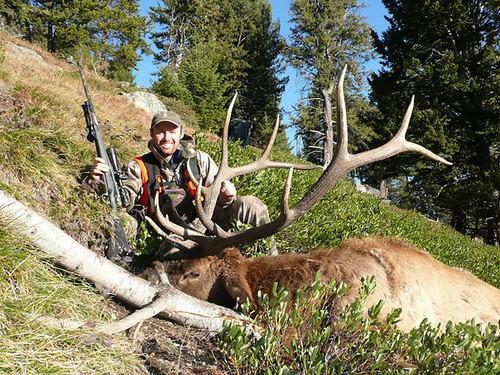 Now the only things I had to worry about was another hunter bumping him out of the country, or as elk so often do, he might disappear for no apparent reason right before the season. Both of my friends were fired up on opening morning and we left well before daylight. There was no way I was going to let anything in my power ruin the hunt. We made it to the spot plenty early. We waited as our sweat soaked shirts cooled off. We put on every bit of clothing we had with us and sat quietly in the dark. During the wait for first light we discussed how we thought the morning was going to turn out. Finally it was time to proceed with the hunt! We worked through the trees to where I had previously watched the bull. As the forest awakened from the frosty October night, we could make out the bodies of a couple elk. As it got lighter, we were able to pick out more elk in the sparse trees on the hillside. It was now twenty minutes after shooting light and the day was absolutely beautiful, not a cloud in the sky. I was starting to wonder if the old bull had put the slip on us, but just as that thought entered my mind, I heard one of my friends say, “There he is.” The bull had moved into sight and we silently crept through the trees to get a shot. As the bull cleared a finger of trees, he stopped briefly to take a bite of grass. The trigger broke, followed sharply by the beautiful sound of a solid hit. The bull went right down. The first words out of my mouth were “I can’t believe our plan worked!” We walked across the hillside over to the bull and I couldn’t have been happier. A great morning with two of my best friends and a great bull, there’s not much that can beat that! After a picture session, we started boning out the elk. I was really glad to have three people on the mountain once my bull was down. We were going to be able to move the entire elk out in one load. All of us own Mystery Ranch Crew Cabs. 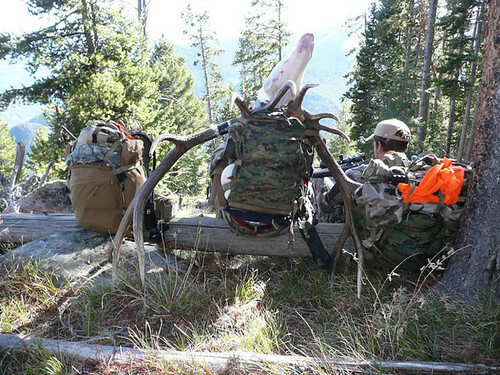 These packs are what made it possible to move that much weight. They are without a doubt, the toughest pack that I have ever used! After cinching down the loads, we helped each other hoist the packs on our backs and started the long hike out. The terrain was very steep and the going was rough. The high brought on by the morning’s events fueled us as we climbed. It was a long slow trip and when it was all done our bodies hurt. The packs ability to handle the excessive weight and do it with comfort made the difference between being able to make one difficult trip rather than having to turn around and go right back in for another load. That was one difficult day! Our bodies were exhausted, and every one of us would have done it again the next day if we had the chance. But thanks to my good friends and Mystery Ranch Backpacks we didn’t have to make a second trip.